That video has come back to haunt Aam Aadmi Party as Chief Minister Arvind Kejriwal, who has blamed much of Delhi's toxic air on stubble burning in neighbouring states, was roasted for the action by Mr Khaira, also the leader of opposition in Punjab. 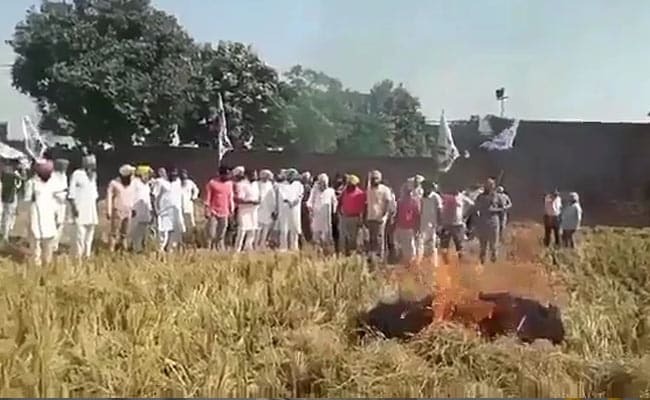 New Delhi: A video put out by AAP's top leader in Punjab Sukhpal Singh Khaira three weeks back to publicise his support for farmers penalised for stubble burning has provoked strong reactions. In this one, he led farmers who set the stubble afire. Unsure how to respond to questions about the video, Mr Kejriwal, the second-most followed Indian politician on the micro-blogging site Twitter, suggested he hadn't seen the video but signalled his disapproval. "But if Mr Khaira did it to register his protest, it was wrong," he said. On a defensive, Mr Khaira, however, made clear he had no regrets and would do it again if it helped improve the plight of farmers. But much of the criticism and the campaign against him, the AAP leader said, made it seem as if he had gone around burning stubbles in Punjab. It was a one-off protest, he told NDTV, to protest the way Punjab had gone about penalising farmers for stubble burning without supporting them to get heavy machinery that would have helped them convert the stubble into manure. In October 2015, the National Green Tribunal had ordered the Punjab government to help farmers so that they wouldn't burn the stubble. "But no government helped them," he said, taking a swipe at the previous BJP-Akali coalition and the Amarinder Singh government. "It is the failure of government... that is now shifting the onus on farmers," said Mr Khaira, a sentiment echoed in statements by the AAP government in Delhi that has stressed prosecution of farmers wasn't the way out. "How many farmers are you going to fine... They are already in a bad shape," said Mr Kejriwal.